Nonlinear curve fitting and data analysis. Is there a better alternative to Fityk? Is Fityk really the best app in Science category? Will Fityk work good on macOS 10.13.4? Added calculation of confidence intervals and fixed several bugs. Fityk needs a review. Be the first to review this app and get the discussion started! Fityk needs a rating. Be the first to rate this app and get the discussion started! 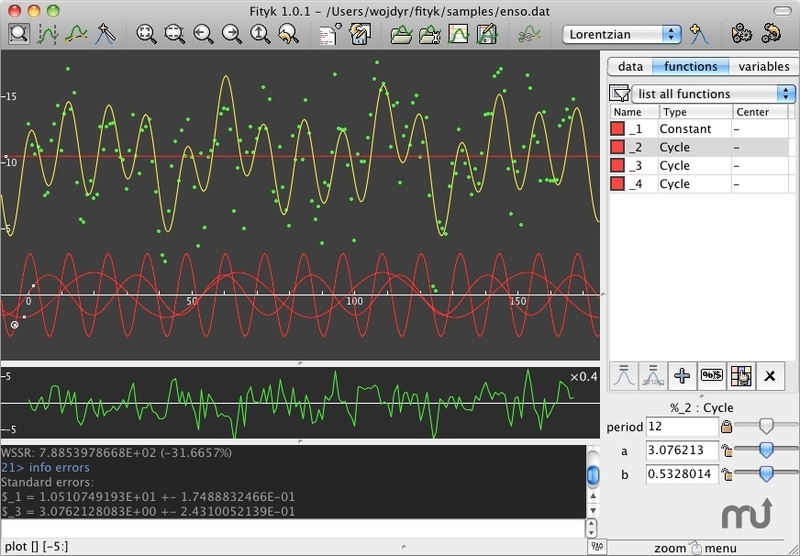 Fityk is user friendly, open source software for nonlinear curve fitting and data analysis. It is primarily used by scientists to analyze data from experiments (powder diffraction, chromatography, photoluminescence and infrared and Raman spectroscopy), but can be used to fit any analytical functions to any kind of data. The program allows data visualization, background subtraction, separation of overlapping peaks and least squares fitting. Macros can be used to automate repetitive tasks. Fityk has a dedicated support for placing and fitting bell-shaped functions such as Gaussian, Loretzian, Pearson 7, Voigt, Pseudo-Voigt and Doniach-Sunjic.